In case anyone hasn’t heard, there is a new series of Baking Mad with Eric Lanlard coming to Channel 4; it started yesterday on 5 March at 12:05 and will run every day for 4 weeks. Each 30 minute episode will feature three members of the public who will come to his cookery school, Cake Boy, to demonstrate their baking skills and take part in a “Bake Off”. Our very own Dom of Belleau Kitchen will be featuring on 15 March. So that I can share in the fun, I am baking one of Eric’s recipes developed especially for the series. Amazingly I still had some chocolate ale left over from the triple chocolate ale brownies I made a year ago and even more amazingly it was still potable. 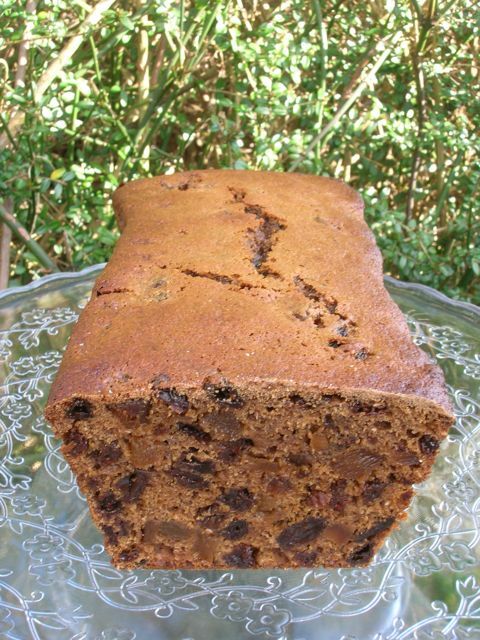 Taking this as a good omen I decided to have a go at making this chocolate ale fruit cake. The flour, sugar and my chosen recipe were provided by Baking Mad. The afternoon before the day of baking, I placed 390g dried fruit (mostly raisins, but some pineapple & some papaya) in a bowl. Added 250ml chocolate ale, gave a good stir, covered and left in a warm place (over a heater) overnight. Stirred in 100g dark muscovado sugar. Beat in 2 duck eggs – hooray, duck eggs are back in season! Sifted in 85g self-raising flour, 100g wholemeal self-raising flour and 3 tsp mixed spice (my mix was allspice, cinnamon, mace, cloves & cayenne). Folded the flour in and poured into a buttered 21.5 x 11 cm loaf mould. Baked at 140C for 1.5 hrs. Left to cool in the tin for 15 minutes then turned out onto a wire rack to cool completely. This is a robust tasting cake to sustain the workers or as CT put it, “probably good with a nice mug of builder’s tea (or chocolate ale even) brought out wrapped in waxed paper from a pair of overalls for elevenses after a long session digging over the beds”. It is tangy and moist with a nice chewy texture and is delicious toasted with butter. just think of the tasty house you could build with bricks like that! Trouble is, it wouldn’t last very long Dom – either that or it would get mouldy! Chocolate ale? Sounds interesting! I’m off to set up Sky Plus for 12.05. When is Dom on? The cake looks great. Thanks, Dom is on show on 15th March – so he tells me! I’ve updated the post now to reflect this. Ohhhhh – now I’ve seen your post I’m kinda wishing I had picked that from the list of recipes lol. Its looking ultra tasty I must say. Lets hope my ice cream turns out just as well as your loaf has for Baking Mad! Swap some of your ice-cream for a slice or two of this? You make great ice-cream – it will be delicious Chele. Mmmm! Chocolate ale, fruit and cake, I think I could live on this. I haven’t seen Baking Mad, I’ll see if I can find it on whatever Channel 4’s catch up is! Think it’s 4OD Jude. Unfortunately our broadband isn’t up to playing that very well, so am hoping it will be alright on the night! I’ve never seen this programme but if Dom is on it we mustn’t miss it!! Ha ha, indeed not. He’s on the 15th March apparently. Wow! Another fantastic recipe with an appetizing & original brick look! Sounds really amazing ! Thanks, you made me laugh. Have never really thought of a brick looking appetising before! Oh gosh! Just pressed the wrong button & my last comment is gone! These bricky looking Chocolate ale cake looks tasty to me especially when there’s ale in it! We could do a swap – a slice of green tea loaf for a slice of this! Looks like a lovely loaf! I’m not a big fan of ale to drink but it does work well in cooking (I use it to soak fruit for hot cross buns). Love the idea of chocolate ale – definitely one to try! Alcohol generally works better for me in cooking, but I did have a glass of this ale and it was very nice. Your hot cross buns sound delicious – any particular type of beer? Wow – congrats to Dom! Also, I never know of chocolate ale before, that sounds delicious! I don’t have that one, but am hoping I might be getting it as a thank you for doing this post! I think that I possibly have a bottle of the same chocolate ale, from the same brownies from last year. Although I might have made a casserole with it. Possibly. The underside of your loaf does look remarkably brick like, all down to the loaf tin of course. Take it you’re not an ale drinker either then Helen. I am so ridiculously unobservant, I didn’t notice it looked like a brick until it was pointed out – doh! Sounds great! I keep meaning to try baking with booze – perhaps not chocolate ale, but stout or similar. I’m put off by having leftovers though – I’m not a big drinker! It should keep C if you don’t use it all in one bake. Weirdly, I was just thinking it was time I paid you a visit when your comment popped up! Well this is a great cake! Certainly a solid will travel well and be enjoyed experience. Yes, it’s currently going in CTs lunch boxes to sustain him through his 15 hour days! That looks really wonderful Choclette and I like the thought of chocolate ale in it. I just posted a recipe from the series too. I picked the same one as Janice, funnily enough. I am looking forward to Dom’s debut next week too! Thanks Jac. It’s funny how we seem to be going for the same recipes. Karen’s doing this one too! that last photo looks like a brick which makes it seem dense and crunchy on the outside (not that I have ever eaten a brick) but the first one looks moist and full of good stuff – could you taste the chocolate?